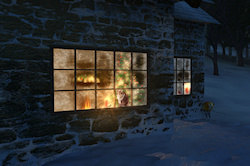 There are 9 images tagged with “Christmas”. I started out with a snowflake ornament, and intended this picture to celebrate the first day of winter, but I decided the star looked better. 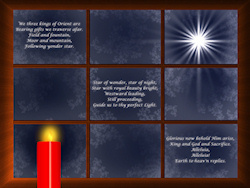 I think it was still appropriate, to celebrate the Light of the world on the longest night of the year. And that year it was also the new moon, so it was the darkest night as well! 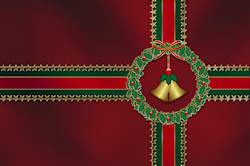 I had designed these golden bells for an invitation, and then wanted to make more use of them, so I added the wreath and striped ribbons to make a Christmas desktop design. 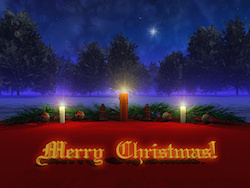 This Christmas-themed illustration uses several Apophysis fractals for texture. I had seen another wallpaper with hanging ornaments like this and wanted to try something similar. 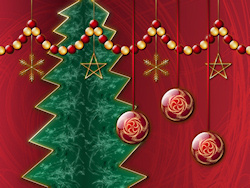 The golden swirl fractal is one of my particular favorites, and it worked well as an ornament design.